To enroll at Areisha Spirit Academy, where young priestesses learn how to form contracts with Spirits, the ideal prospective student has always been pure, chaste, and of a superior lineage. And female, of course, since only one man has ever made a Spirit contract and HE was the Demon King. So when Kamito Kazehaya arrives at the Headmistress' request, the entire Academy is understandably thrown into chaos and confusion. Because not only is Kamito very obviously a guy, but he also managed to form a Spirit contract in the short time it took him to walk through the woods surrounding the Academy! How is this even possible? And what other secrets might the new enrollee have hidden? 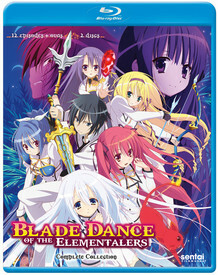 The unexpected intrusion of something male is certain to work the female student body into a tizzy as the answers are revealed in Blade Dance of the Elementalers! Special Features: Japanese Promos, Blade Dance Special Mini OVA's, Clean Opening & Closing Animations.